Kid-friendly hotels in Vancouver, BC with large rooms or suites that can accommodate 5, 6, or 7 guests are listed in alphabetical order below. All of the hotels listed here are in the downtown area. You’ll find Vancouver family accommodation near English Bay, Yaletown, Stanley Park, BC Place, and Robson Street! See the $ symbol for the price per night or rate range. The $-symbol key is in the sidebar. Look for the hotels with $$ for a budget-friendly, cheap place, or $$$$ for a more luxury hotel. There is a wide variety of room configurations available. Some of the family rooms have multiple two-person beds, like a Queen or King, in one large room with space for an extra rollaway bed or two. And some hotels have one- or two-bedroom family suites, where a larger bed is situated in a separate room, and a sofa bed may be used in the living area. All have private bathrooms (ensuite) unless otherwise mentioned. Often, a crib (baby cot) is available for guest use. Click on the hotel name for more details. The details include a location street map, a summary of the hotel’s main amenities, and contact information. There is a link for hotel reviews and tips on how to book. 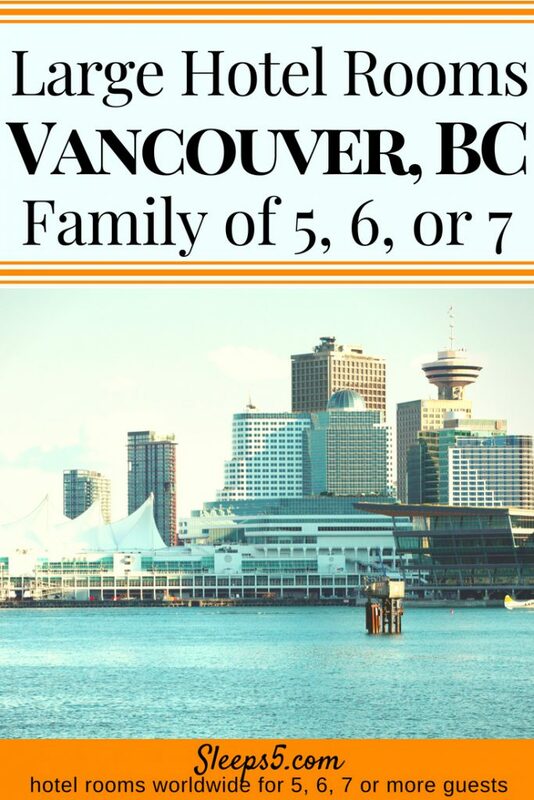 We hope Sleeps5 helps you find exactly where to stay in Vancouver with family! Vancouver, British Columbia is a majestic place. Our family is consistently humbled when we make the trek up I-5 from the much more modestly-sized Seattle. 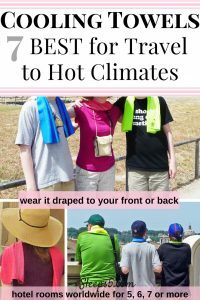 Click here to see Seattle Hotels for Family of 5, 6, or 7. Vancouver is an immense city surrounded by dark blue water and snow-capped mountains which feel so close you could reach out and touch them. We also love the quirky downtown neighborhoods and the sprawling parks. There is simultaneously a sense of grand and quaint in this city with a metro population of 2.3 million people. An especially favorite memory was driving up for the 2010 Winter 0lympics!! And Sandy’s family drove to experience the Olympics, too! The hospitality, generosity and joy of the local folks was contagious. This great Canadian city should be on every family travel wish list.